The Retail Employees Superannuation Trust Fund (REST) has continued to deliver competitive long-term investment returns to its members. This is good news for SDA members as most members have their superannuation funds invested with REST. 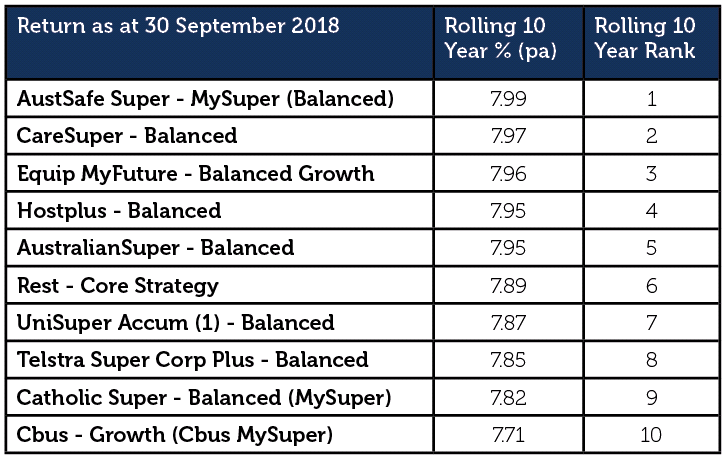 As at 30 September 2018, the REST Core Strategy posted 7.89% per annum returns over the past rolling 10 years. This compares positively to the median 10-year fund return of 7.15% p.a. This is a strong result and well above the Core Strategy performance objective of Inflation + 3% p.a. over a rolling 10-year period. The REST Core Strategy performance amounts to around a 105% cumulative return during the past 10 years. REST’s ranking on this table shows it continues to be amongst the top performing superannuation funds. REST places a strong emphasis on protecting members’ investments against adverse economic and investment risks as markets move through the highs and lows of the investment cycle. REST believes understanding and managing uncertainty and risk is central to this process of ‘smoothing the investment ride’. For this reason, REST continues to see good reason in keeping their well-diversified and relatively conservative positions in place. Globally, economic growth remains solid. Underpinned by a healthy labour market and strong consumer confidence, the US recovery is now the second longest on record. However, valuations of almost every asset type seem expensive in the context of both the long-term economic outlook and historical averages. This makes the investments susceptible to volatility. At the same time, ongoing US-China trade tensions as well as inflation and interest rate hikes thanks to strong US growth could pose a key threat to the global economic outlook. In Australia, record household debt and a cooling housing market are good reasons to stay vigilant and adopt more defensive investment settings. Currently, the REST Core Strategy has about 10% less exposure to share markets in comparison to the median balanced superannuation fund. REST is also holding 4% more in cash than the median fund. These positions mean that if and when markets fall, this will reduce the impact of share market losses to members and allow REST to purchase shares and other assets at cheaper prices thereby setting members up for stronger gains when the market rises again.